Marti Forchion and husband Mark Chapman, III in Tallahassee. 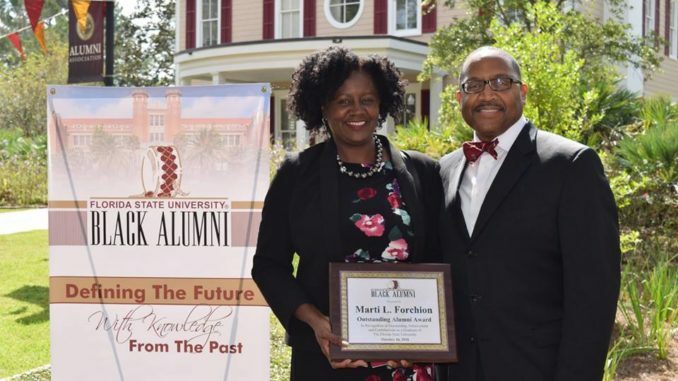 The Florida State University Black Alumni Association (BAA) recognized Jacksonville author, Marti L. Forchion, with the “Outstanding Alumni” award during its recent 2016 Black Alumni Homecoming Reunion National Awards Brunch, held at the FSU Alumni Center on the campus of Florida State University in Tallahassee. 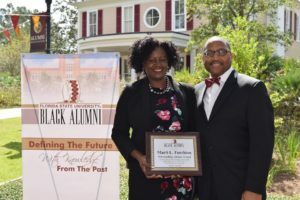 The Outstanding Alumni Award is presented to alumni who have made significant achievements and contributions to their communities, professions or countries since their graduation from FSU. Ms. Forchion received her Bachelor of Science degree in Computer Science from Florida State University and has enjoyed a successful 20-year professional career in the Information Technology field. 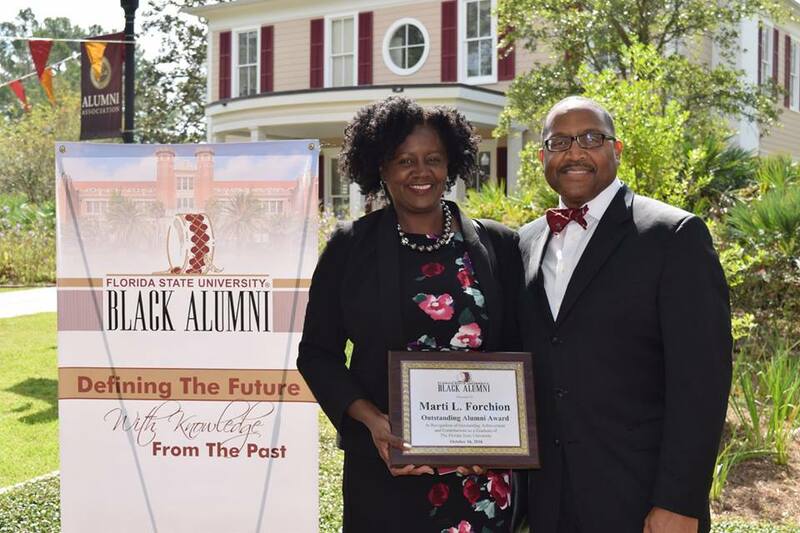 Ms. Forchion is described as “a quiet storm comprised of a gentle spirit and a fierce determination that is the foundation of our FSU community. Her innovation and creativity is only surpassed by her humility.” She is the author of “The A+ College Prep Planner – The Ultimate College Admissions Planning Guide for High-School Students (and their Parents)” and creator of the website http://collegeprepplanner.com. 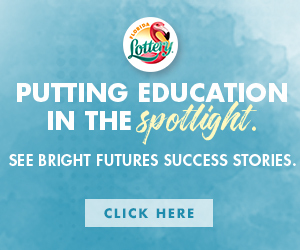 Her dream of writing a “navigational guide” of the college admission process came to fruition after the experiences she encountered while preparing her own three children for a post secondary education. The A+ College Prep Planner is a step-by-step guide that focuses on each year of high-school and encourages 9th – 12th grade students to take an active role in their educational development and future plans to attend college. As a member of Delta Sigma Theta Sorority, Inc., The Jacksonville Chapter of the Links, Incorporated, and the Jacksonville Silhouettes (where she serves as President), Ms. Forchion helps to transform the lives of students and families through her commitment to community service and social action. In addition, she has been actively involved for many years in student mentoring programs and student leadership programs through organizations such as Take Stock in Children, Junior Achievement, and Jack and Jill of America. Ms. Forchion and her husband, Mark Chapman, III, have 3 adult children.